We carry a wide selection of Leggett & Plat Electris Adjustable Foundations. 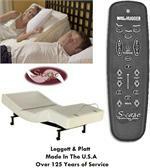 Our most popular adjustable bed in our retail store is the Prodigy; Due to all the excellent features. It is very quiet when you are adjusting the base and the massage controls are very easy to use. The wireless remote has many features and it is very easy use even in the dark. When adding one of our Latex or Organic mattresses to any of our adjustable foundations you will be in a very comfortable position. The inspired design of the Prodigy adjustable bed base is a welcome indulgence for all who seek tranquility. Feel the stress melt away when you activate the sensuous built-in massage.Change positions with ease with our wireless remote.